a person who performs a service willingly and without pay. As a Peace Corps volunteer, I am prohibited from accepting money for any services that I provide, but it would not be true to say that I work for free. While I don’t receive a salary, my basic needs are met. I am provided with a house and enough money to buy food and other necessities. The stipend I receive is supposed to allow me to live at approximately the same level as a typical Host Country National and I live comfortably, though certainly not at the level to which most Americans are accustomed. Since I just finished doing my taxes and since I’m often asked “How much money to you get?”, I thought I would detail exactly what I do get. I’ve converted all amounts to US Dollars. In Tonga, each organization that hosts a Peace Corps volunteer is responsible for providing a house for that volunteer. The house must have locking doors and windows, a bed, a table with at least two chairs and fresh water must be available within a reasonable distance of the house. Sometimes, this means the volunteer will live on a school campus or in a house owned by the organization or by someone who works for the organization. In my case, my organization, The Tonga Development Bank, pays to rent a house for me. (And by Peace Corps standards, I have a really nice house). The bank pays my landlord $177 per month for my house. Since December, the bank also is paying $97.00 a month for my utilities. Previously, I was paying those bills myself. That means the bank pays about $3200 dollars a year to have me work for them. In addition to having my housing provided, Peace Corps pays me a monthly stipend of $310 to cover all of my expenses. That works out to just over $10 a day for all my food and expenses. If you are counting, that means I get about $3700 dollars a year from the US Government for my volunteer service. That total also includes $24.00 a month that is classified as a vacation leave allowance. We get $12.00 a day for each of the 24 days of vacation we are allowed each year. That amount is fixed by Peace Corps headquarters for all volunteers worldwide. The amount of the stipend varies in each Peace Corps country. The vacation leave allowance and a portion of our stipend are considered taxable income. For all of 2008, my taxable income for my work as a volunteer was about $800. For each month you serve as a volunteer, you also earn $225.00 that is held by Peace Corps and then paid to you in a lump sum when you complete your service. This amount is 100% taxable. In 2008, just like every other Peace Corps volunteer in the World, I earned a readjustment allowance of $2700.. I had earned taxable income of approximately $3500 from Peace Corps in 2008. And this year it came with an extra surprise. Since I was not eligible for the Stimulus Program last year when I was still working for a good portion of the year, I found out I can get it this year. That means I’ll be getting a tax credit of $300.00. Since I’ve been in Tonga, I’ve been able to live on my stipend. I have not tapped into any money from home to use in Tonga, even though I have ordered a few things and had them shipped to me. And certainly my stipend didn’t pay for my trip to the USA at Christmas. Vava’u, the island where I live in the most expensive in all of Tonga. We pay more for everything here than anywhere else in Tonga. To be fair, we also don’t have the same choices or temptations as the volunteers on the main island. But part of being a volunteer is living with and like the Tongans. That means if you don’t have something or you can’t afford something, you just do without it. Six Peace Corps volunteers who live on the main island of Tongatapu had a chance to meet and talk with the King of Tonga this week. You might think that in a country the size of Tonga, that would not be uncommon. However, the King is well “King” and he can pretty much pick and choose with whom he wants to visit. 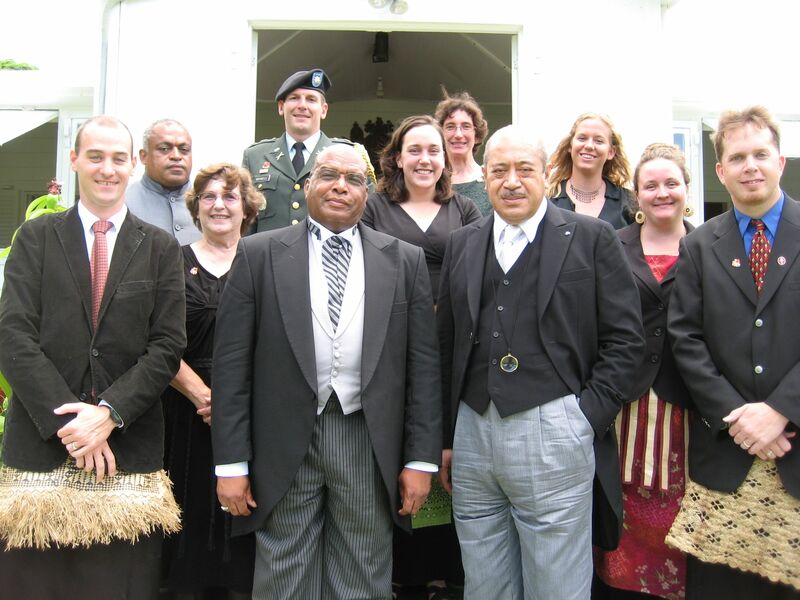 The King, George Tupou V, is wearing the light colored gray pants and black vest. Scot is pictured on the far left in the red tie. The other volunteers in the photo are Carol, who is next to Scot, Bethany is to the right of the King and Emily is over the King’s left shoulder. Heather and Blake are on the far right of the photo. Not worth it. They can atleast pay a bit so you don't end up 2 years empty-handed............such a shame. Hey! Just wondering if you were ever able to save any of your monthly allowance...maybe that's a dumb question. But I am just wondering if even 10 dollars a month could be salvaged? I did save money....enough for a plane ticket to New Zealand. That was over the course of about a year, but I never had any trouble living on my allowance. I'm applying for the Peace Corps right now but am worried about my student loans. Do you think it's possible to save enough money in order to keep making minimum payments on them? My current private lenders only allow deference of loan for up to 1 year. Peace Corps volunteers are America's best ambassadors. I do agree with others that more could be paid more but NOTwhile they are living abroad. The re-adjustment allowance could/should be increased. Alternatives could be education benefits like the military receives. The Peace Corps are good for America. Hollywood shoud not be America's principal exporter of culture. Thank you for sharing. As a Peace Corps Volunteer candidate, this was very helpful. A friend of ours is going in the Peace Corps in February. It's interesting reading about various peoples adventures, and their lives while living in the Peace Corps.